We often experience that German authorities are very fast in taking African children away from the parents under the pretext of the so-called „well-being“ of the child. We protest the attitude of German authorities to question the African parents‘ capability to raise their children and, in an act of „Germanization“ of children, to push back African influence and culture in them by subjecting them to so called German cultural values - which can also be used as a tactic to facilitate deportation of the parents one day. We also protest the hypocrisy of the German system in which the socalled well being of the child is used to separate familys – but the right of protection of familiy is not being considered when it concerns the right of familys to live together - due to the cruelty of the German asylum system! Jubilee with her children is forced to live hundreds of kilometers away from her husband and father of her twins and is therefore separated from his support in raising their children. At this point we call for the reunion of all family members of this African family. We strongly insist in the right of the mother to raise her child – and the right of the child to live with the mother. The forceful separation of parents and children is an abuse on both sides. Especially for an African child the connection to the African roots, background and identity is of high importance. We are very sensitive and critical about any racist subtext in the actions of German authorities. „(1) Marriage and the family shall enjoy the special protection of the state. Let Jubilee Sunday live united with her husband! Let Favour live together with her family! We are calling for support und solidarity with Jubilee Sunday! Wir protestieren gegen die Haltung der deutschen Behörden, afrikanischen Eltern das Recht auf die Erziehung ihres Kindes zu verweigern. Wir erleben immer wieder, dass deutsche Behörden sehr schnell sind, wenn es darum geht, afrikanische Kinder unter dem Vorwand des sogenannten „Kindeswohls“ ihren Eltern wegzunehmen. Wir protestieren gegen die Haltung deutscher Behörden, die Kompetenz der Eltern anzuzweifeln und, in einem Versuch, die Kinder zu „germanisieren“, afrikanische Einflüsse und Kultur in den Kindern zurückzudrängen, indem man sie so genannten deutschen kulturellen Werten unterzieht – was auch als Taktik benutzt werden kann, die Abschiebung der Eltern eines Tages zu erleichtern. Wir protestieren ebenfalls gegen die Heuchelei im deutschen System, in dem das so genannte Kindeswohl als Rechtfertigung missbraucht wird, um Familien auseinander zu bringen – aber das Grundrecht des Schutzes der Familie wird nicht in Betracht gezogen, wenn es um das Recht einer Familie, gemeinsam zu leben geht – und das aufgrund der Härte des deutschen Asylsystems! Jubilee ist gezwungen, mit ihren Kindern hunderte von Kilometern entfernt von ihrem Mann und Vater ihrer Zwillingssöhne zu leben und somit getrennt von der natürlichen Unterstützung in der Erziehung der Kinder. An dieser Stelle rufen wir zur (Wieder-)vereinigung aller Familienmitglieder dieser afrikanischen Familie auf! Wir bestehen entschieden auf das Recht der Mutter, ihr Kind großzuziehen – und auf das Recht des Kindes, mit der Mutter zu leben. Die zwangsweise Trennung von Eltern und Kindern ist eine Missbrauch gegenüber beiden Seiten. Besonders für ein afrikanisches Kind ist die Verbindung zu den afrikanischen Wurzeln sowie zu afrikanischem Hintergrund und Identität besonders wichtig. Wir sind äußerst sensibel und kritisch gegenüber jeglichem rassistischem Unterton im Handeln der deutschen Behörden! Jubilee Sunday soll zusammen mit ihrem Ehemann leben! Favour soll zusammen mit ihrer Familie leben! Wir rufen zur Unterstützung und Solidarität mit Jubilee Sunday auf! Wir bestehen entschieden auf das Recht der Mutter, ihr Kind großzuziehen – und auf das Recht des Kindes, mit der Mutter zu leben. Die zwangsweise Trennung von Eltern und Kindern ist ein Missbrauch gegenüber beiden Seiten. Besonders für ein afrikanisches Kind ist die Verbindung zu den afrikanischen Wurzeln sowie zu afrikanischem Hintergrund und Identität besonders wichtig. A young eritrean woman, Tsnaid, T., was chased to suicide. She took her baby Nahom with her in to death. Tsnaid, T. experienced, like many other people in the Lager Auf dem Angespanne 3, ongoing illegal razzias and deportations, during which the thuringian Landespolizei broke into every room in the Lager. This and the following isolation of her comunity through the authorities of the Landkreis chased her to death. The iraqi kurd Faraidun Salam Aziz was locked up illegaly in his room by security in the Lager in Lessingstraße allthough he was panicing in closed rooms. Shortly after he fall out of the window. Another person was chased to suicide by the circumstances in Apolda, and life saving measures were denied to another one. These are only the dead people of one year, and only those we know about! ignoring the whole thing. For the predominant policy of deterrence adverse refugees and migrants these circumstances are convenient anyway. December 2017: Demonstration in Apolda Already in december 2017 The Voice Refugee Forum had pointed out the racist violence in the Lager together with local refugees and demanded to stop immediately the attacks of the police, the isolation and the deportations. addition people were and are still forced to go to their ambassies for proof of identity illegally in spite of unclosed asylum cases and have to hand over these proofs of identity to the Ausländerbehörde. Otherwise they are denied their existential right to work. The racist structures in Apolda, consisting of Ausländerbehörde, policy, Sozialamt, the operating companies of the Lager, security and police are working hand in hand. The following political meetings in Apolda were observed by the police, while at the same time the cases of death were not examined by the responsible criminal investigation apartment in Jena and the realtives of the deceased persons wait unavailingly for clarification. koloniale Ungerechtigkeit. RefugeeBlackBox ist revolutionäre Solidarität, sich auszusprechen und miteinander zu handeln. Wir rufen Flüchtlinge auf, ihre BlackBox herauszuholen! Verwendungszweck: RBB Solidarity @ The VOICE e V.
Unsere Aktivitäten werden allein durch private Spenden und Solidaritätsinitiativen finanziert. In October 2018 refugees gathered in Jena to unfold and manifest the idea of the Refugee Black Box (http://thevoiceforum.org/node/4603). Since then refugees could express themselves by the Refugee Black Boxes on many occasions and places during court hearings, in various lagers in Germany, on demonstrations and even in community spaces. Now, half a year later, we would like to meet again in Jena to evaluate how the ideas developed in October 2018 haven already been realized and how the ongoing activities can be connected to empower more refugees to express themselves through their own Refugee Black Boxes. Together we want to share the experiences and find out how the Refugee Black Boxes could facilitate by simple form of actions the activism of refugees in the context of intensified deportation and isolation terror. Spread the call for the upcoming evaluation meeting and come to Jena to meet those who have already been active to learn from each other. We believe that everyone has manifold talents and a universe of practical experience. But neither our talents nor our experience count in a system of exclusion. We even are not able to share with each other our experiences because we are forced to live in lagers. Besides language and a colonial school separate us from each other. But for us the connection is important to overcome the boundaries, prisons and deportations that are made for us. Connection knowing each other and thereafter comes solidarity when we start to understand that our freedom is bound to each other. Solidarity is survival because the system will not protect but exploit us. Share the call with your fellow refugees and come to Jena to share your experiences. We say everyone needs her or his own blackbox to provide and share her or his knowledge with the community. Some of us even say, every refugee is black box. Come to Jena to learn about the Refugee Blackbox, to support the ongoing activities of refugees in Thuringia and elsewhere, and to expand the network of the refugees. 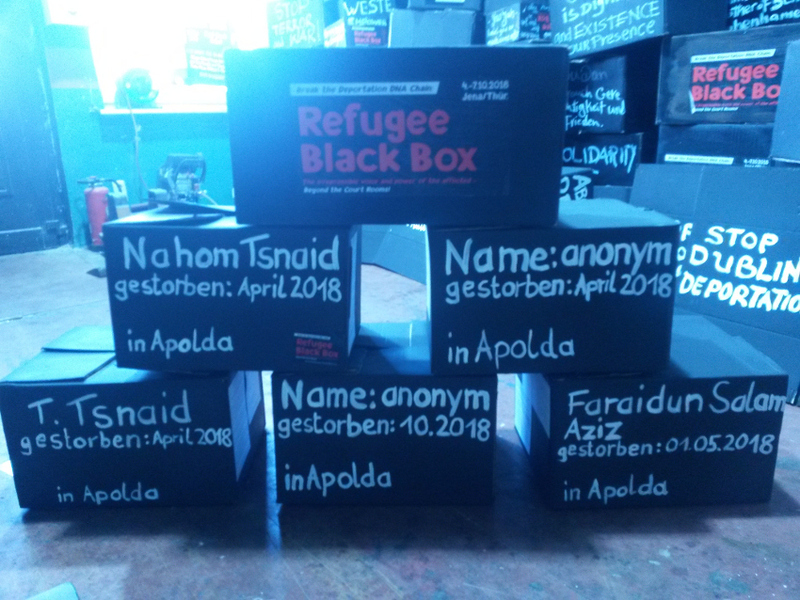 The #RefugeeBlackBox is a political tool to expose and protest the injustice with your hands, brains and hearts and in solidarity with the oppressed refugees‘ struggles. Your cry for justice and against the injustice against the refugees. Your positions and demands will make part of the million x #RefugeeBlackBox. Speak out! I speak, you speak, we speak and many many more people will speak in million x solidarity. Revolution can be planned! Sharing is caring! Workshop Topics - We will discuss about developing #RBB installation and on the presentation of campaigns and protests actions. - Installation workshops: Open space lnstallation: Action forms and refugee lagers. - Racism is killing: Our demands and protest actions in Apolda and other refugee lagers: 5 deaths from refugees‘ social exclusion and the trauma of deportation in Apolda. - Break the culture of deportature – all about deportation. - The selected 32 Slogans of the #RefugeeBlackBox installation from the 24th anniversary of The VOICE, October 2018 in Jena. - Boxes and T-Shirt installations: graphic slogans, hand prints in cartons, plastics, canvas and other materials. - Break Deportation Network solidarity concert in Erfurt, 2nd May 2019. - Inputs on evaluation meeting of the #RefugeeBlackBox in October 2018 which will take place 5th to 7th April 2019 in Jena. MaRch - Installation Workshops Fabrik: 15th-17th March 2019 in Eisenberg. apRIl - 1st Nationwide Evaluation meeting of #RefugeeBlackBox Installation and Action Forum: 5th-7th April 2019 Jena. May - Concert with „Die Goldenen Zitronen“: 2nd May 2019 in Erfurt. Reclaim your dignity and unite against deportation. - Break Deportation Network Solidarity donation to The VOICE #RefugeeBlackBox Installations. OctOBER - Nationwide #RefugeeBlackBox Installation in October 2019: Discussion on the daily activism of #RBB. We call for donation and support in our struggle to organize in the refugee community of migrants in Germany to fight against deportation and against colonial injustice, for as long as it takes us to reclaim the justice in dignity of equals. It is racism and it is a crime of colonial injustice! Fight, Break it and Stop the deportations and colonial injustice! #RefugeeBlackBox is a Revolutionary Solidarity Act to speak out and act together – a powerful tool of our political struggle – nationwide and beyond. We call on Refugees to check and look out for their Black Box locations. Make Donation To The #RefugeeBlackBox Solidarity! Our activities are financed by private donation and by Solidarity initiatives only. The Refugees in Gotha, Thuringen are in everyday facing threat of deportation, this has become a major issues that through the mind of every Asylum seekers in Gotha, Thuringen. The refugee Hem in Kindleberstrasse 101, 99867. Which have more than 70 people, is not a good shelter for refugees in Gotha, Thuringen. No Human Being is illegal. The Reason for life is for life to help another life: The government have to stop humiliating the Refugees because they are killing us physically and mentally. We are all humans with feelings and futures. Stop Deportation! So many have died because of deportation. They committing suicide because of the danger awaiting them in their homeland. Stop Stop Deportation, we need security, protection and integration while we are here. We are not slaves and the world belongs to all of us. Treat us with respect. We are humans like you! Nobody will leave his home without a reasons and goes to another mans land to seek for asylum. We are here because our homeland has been distroyed, we need protection. We are not here to destroy your country, we are not here to change your culture. Solidarity forever. No to oppression. No to racism. No to xenophobia. Kein Mensch ist illegal. Der Grund des Lebens ist, dass das Leben einem anderen Leben hilft: Die Regierung muss aufhören die Geflüchteten zu demütigen, weil sie uns psychisch und mental töten. Wir sind alle Menschen mit Gefühlen und einer Zukunft. Stoppt Abschiebungen! So viele Menschen sind wegen Abschiebungen gestorben. Sie begehen Selbstmord, wegen der Gefahren, die sie in ihrem Heimatland erwarten. Stoppt, stoppt Abschiebungen; während wir hier sind, brauchen wir Sicherheit, Schutz und Integration. Wir sind keine Sklaven und die Welt gehört zu uns allen. Behandelt uns mit Respekt. Wir sind Menschen wie ihr! Niemand verlässt sein zu Hause grundlos und geht in in ein anderes Land, um Asyl zu beantragen. Wir sind hier, weil unsere Heimatländer zerstört worden sind, wir brauchen Schutz. Wir sind nicht hier, um euer Land zu zerstören; wir sind nicht hier, um eure Kultur zu verändern. Solidarität für immer. Nein zu Rassismus. Nein zu Fremdenhass. The refugee Hem in Kindleber strasse 101, 99867. Which have more than 70 people, is not a good shelter for refugees in Gotha, Thuringen. BLACK BOX. All depends on us. The system does not protect us. Let‘s organize us together. Unterstützt Jubilee durch eure Anwesenheit, indem ihr sie anruft oder indem ihr eure Besorgnis und Empörung gegenüber den zuständigen Behörden äußert! Hintergrund und Kontaktdaten von Jubilee, Jugendamt Peine und des Gerichts siehe Link! We call on Refugee to check out their blackbox locations. In sight of refugees black box solidarity protest - installation workshop tour in Thueringen. Bank Account code: RBB Solidarity @ The VOICE e V.
Empowering the tools of our political struggle that defines our actions. The refugee black box is a political tool to expose and protest the injustice with your hands, brains and hearts and in solidarity with the oppressed refugees‘ struggles. Join us to produce the Refugee Black Box and empower your box with statements on the crimes and violations on refugees and migrants rights: your cry for justice and against the injustice against the refugees. Your positions and demands will make part of the million X RefugeeBlackBox. Refugee Black Box Solidarity is a powerful tool of our political struggle - nationwide and beyond. Stop the deportation and colonial injustice! Compliments to Refugee Black Box activism in Sachsen-Anhalt, Berlin, Baden-Württemberg, Bavaria, Hamburg, Thueringen, Hessen, Northrhine-Westfalia, Niedersachsen. Our activities are financed and supported by private donations and with solidarity initiatives only. Your Knowledge is your Refugee Black Box! Positions, demands, protest, testimonies and statements against the injustice on refugees and for freedom of movement: Empowering the tools of our political struggle defines our actions! Time: Friday, at 4pm till Sunday, 4pm. - We will discuss about developing RBB installation and on the presentation of campaigns and protests actions. - The selected 32 Slogans of the refugee Black box installation from the 24th anniversary of The VOICE, October 2018 in Jena. - Inputs on evaluation meeting of the refugee blackbox in October 2018 which will take place 5th to 7th April 2019 in Jena. - Installation Workshops Fabrik: 15th-17th March 2019 in Eisenberg. - Concert with „Die Goldenen Zitronen“ 2nd May 2019 in Erfurt: Reclaim your dignity and unite against deportation - Break Deportation Network Solidarity donation to The VOICE Refugee Black Installations. - Nationwide Refugee Black Box Installation in October 2019: Discussion on the daily activism of RBB. Organize, organize: Our presence is our dignity and also the power of our autonomy to self determination. It is racism and it is a crime of colonial injustice. Fight, Break it and Stop the deportations. Refugee Blackbox is a Revolutionary Solidarity Act to speakout and act together. Our activities are financed by private donation only. The manifestation with the focus on the Refugee Black Box was at the same time the celebration of the 24th anniversary of THE VOICE Refugee Forum (formerly THE VOICE African Forum) that started in 1994 in the Isolation Lagers for refugees in Thuringia. People from the various corners of the republic came to Jena to further develop and manifest the idea of the Refugee Black Box. The entire activity was documented by two activists and will be published successively through the various internet channels listed at the end of this summary. The Refugee Black Box is a process to enable refugee communication, resistance, and at the same time an archive of the experiences and the lessons of the past with all its weak and strong moments. The name is derived from the blackboxes used in the aviation to record all the relevant data during a flight but it is more than that because it is about people and humanity. Therefore, the process is made by people communicating with each other and hence, it can unfold their creativity and enhance their collective consciousness. The aim of the Refugee Black Box initiative is to establish a continuous process to strengthen the communities and their cohesion through international solidarity. Through the Refugee Black Box the truth about the daily crimes imposed on refugees can be documented and messages of solidarity and empowerment from the local struggles sent to other communities as has already been done in the recent month. Through the use of a black box with a message written on it connections are easily made between refugee communities from the various points of Germany and elsewhere. Paintings, photos, videos, audios and texts can be distributed using various channels in the internet or by installations and performances on the street. All depends on the quality of how the process is documented and distributed to build bridges between people and communities. Refugee Black Boxes can be installed in isolation camps and lagers to gather the complaints by the refugees of those camps. In regular meetings the complaints can be discussed by the same people and possible solutions discussed. The documentation of the entire process can be published. By doing this the situation behind the fences of the European lager system and thus the crimes exercised there become public. Such Refugee Black Boxes for collection of complaints can of course be put everywhere people think it is efficient to collect the concerns of the community and discuss them collectively, at the refugee and migrant associations, at the Ausländerbehörde, on the street, or anywhere else… There is no limit and it must not only be a complaint box. Basically every refugee, migrant and everyone else can create her or his own Refugee Black Box and make the process of its generation and use transparent. The participants in Jena from Apolda, Berlin, Bielefeld, Hamburg, and Wuppertal are committed to organize local workshops and gatherings within their local communities to further spread the Refugee Black Box. Because it is itself the empowerment and engagement of refugees and migrants. It is the demonstration of their solidarity and transparency. The members of the network CARAVAN for the rights of refugees and migrants will have a special Refugee Black Box session during their next nation-wide meeting. THE VOICE Refugee Forum is planning to have an annual meeting at the beginning of October to manifest a long term process. Everyone is invited to actively enrich the process. The finale of the Refugee Black Box in Jena was a parade in the city center. Installations with the 24 boxes were made at the Faulloch where the activities took place and in front of the Ausländerbehörde. A theatre performance was carried out processing the experiences of the artists as refugees. Based on the theatre of the oppressed the spectators could intervene and change story. During the parade it was stated that the Refugee Black Box goes beyond demonstrations and actions. It is a continuous engagement and a process to involve more people into the solidarity and truth initiative. Participate in the next Refugee Black Box activities in your areas or make your own. From the 4th to 7th of October 2018 workshops, discussions, theatre performances, and a parade was initiated and organized by THE VOICE Refugee Forum in Jena, Thuringia, Germany. 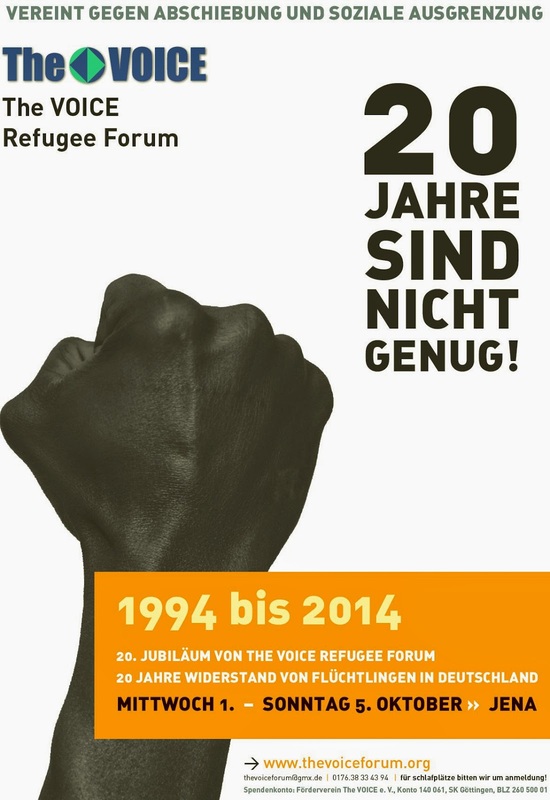 The manifestation with the focus on the Refugee Black Box was at the same time the celebration of the 24th anniversary of THE VOICE Refugee Forum (formerly THE VOICE African Forum) that started in 1994 in the Isolation Lagers for refugees in Thuringia. People from the various corners of the republic came to Jena to further develop and manifest the idea of the Refugee Black Box. The entire activity was documented by two activists and will be published successively through the various internet channels listed at the end of this summary. Jubilee Sunday ist eine nigerianische Asylbewerberin. Sie kam im März 2018 mit ihrer achtjährigen Tochter Favour nach Deutschland, wobei sie hochschwanger war. Beide baten in Hannover um Asyl. Schwester Jubilee wurde durch die deutschen Behörden auch von ihrem Mann getrennt, dem Vater ihrer beiden neugeborenen Zwillinge. Er wurde mehr als 450 km weit von seinen Söhnen weggeschickt und hat seitdem für die Vereinigung der Familie gekämpft. Nachdem man ihre Tochter entführt hatte, die am Morgen zur Schule ging und nicht mehr zurückkam, wurde Jubilee, als wäre das schon nicht genug, am 23. Januar 2019 auch noch einer Gerichtsanhörung in Peine (Niedersachsen) unterzogen, dafür dass sie die Mutter ihres ersten Kindes ist. Das einzige Ziel des Gerichtsverfahrens war es, die Entführung und weitere Entfremdung Favours von ihrer Familie zu legalisieren. Jubilee selbst wurde während des Verfahrens nicht angehört und hatte keine Möglichkeit zu reden und ihren Standpunkt zum Ausdruck zu bringen. Die Entscheidung wurde über ihren Kopf hinweg gefällt. Es ist nun fast drei Wochen her, dass Favour von dem Radar ihrer Familie verschwunden ist und derselbe Grund wird vorgeschoben werden, um die Familienbande, die über acht Jahre bestanden haben, zu zerstören. The VOICE Refugee Forum hat ferner die Information erhalten, dass als Grund für den Kindesentzug die Beschwerde der Tochter herangezogen wurde, dass die Mutter sie geschlagen hätte und ihr nichts zu essen geben würde. Die Mutter weist diese Anschuldigungen entschieden von sich. Da das Kind auch beklagte, dass sie gegenüber den Babys vernachlässigte würde, und aufgrund der Tatsache, dass ihre Klagen mit der Geburt der Zwillinge begonnen haben, ist es sehr wahrscheinlich, dass die achtjährige Favour Eifersuchtssymptome gegenüber den neuen Brüdern zeigt. Dies ist eine normale Reaktion von Kindern, die plötzlich die Liebe der Eltern mit neuen Geschwistern teilen müssen – eine Situation, die aber sicher nicht dadurch gelöst wird, dass man das Kind von den Eltern wegnimmt. Wir bestehen entschieden auf das Recht der Mutter, ihr Kind großzuziehen – und auf das Recht des Kindes, mit der Mutter zu leben. Besonders für ein afrikanisches Kind ist die Verbindung zu den afrikanischen Wurzeln sowie zu afrikanischem Hintergrund und Identität besonders wichtig. Doch leider erleben wir immer wieder, dass deutsche Behörden sehr schnell sind, wenn es darum geht, afrikanische Kinder unter dem Vorwand des sogenannten „Kindeswohls“ ihren Eltern wegzunehmen – sei es dass die Kompetenz der Eltern angezweifelt wird, sei es in einem Versuch, die Kinder zu „germanisieren“, das heißt, afrikanische Einflüsse und Kultur zu reduzieren und sie so genannten deutschen kulturellen Werten zu unterziehen – was auch eine Taktik ist, die Abschiebung der Eltern eines Tages zu erleichtern. An dieser Stelle wollen wir uns an die Kampagne von Claudia Omoroghomwan erinnern, die wir unterstützten, die erfolgreich gegen die Behörden für das Recht gekämpft hat, mit ihren Kindern zu leben (http://thevoiceforum.org/node/1727). Wir sind äußerst sensibel und kritisch gegenüber jeglichem rassistischem Unterton im Handeln der deutschen Behörden. Wir sehen es zudem als äußerst wichtig, dass Jubilees Mann und Vater der Zwillinge das Recht hat, mit seiner Familie zu leben, damit seine Söhne zusammen mit ihm aufwachsen können und damit die Belastung und die Verantwortung, die die Sorge für drei Kinder bedeutet, auf zwei Schultern verteilt wird. Wir sind in starker Solidarität mit dem Fall von Jubilee Sunday und wir beobachten ihn aufmerksam und kritisch. Wir ermahnen alle verantwortlichen Behörden und Institutionen unsere Sorgen sehr ernst zu nehmen!!! „Solidarische Unterstützung für eine Frau namens Jubilee Sunday wird dringend benötigt. Sie lebt in Hohenhamel, Hannover. Jubilee Sunday ist Flüchtling aus Nigeria. Sie kam am 31. März 2018 zusammen mit ihrer achtjährigen Tochter hochschwanger nach Deutschland. Beide ersuchten in Hannover um Asyl. Am 17. April 2018 entband sie ein Zwillingspärchen, zwei Jungen, als sie noch im Lager lebte. Später, im Juli wurde sie mit ihren Kindern in ein Heim in Hohenhamel umverteilt. Dort sind sie die einzigen Nigerianer und die einzigen Schwarzen. Alle anderen Flüchtlinge sind Araber. Die kleine Favour wurde in einer Schule angemeldet. Ein Schulbus kommt täglich, um sie zusammen mit den arabischen Kindern abzuholen, und bringt sie nach der Schule auch wieder nach Hause. Auch am Montag, dem 14. Januar 2019, ging Favour zur Schule, während ihre Mutter sich zuhause um die Zwillinge kümmerte. Als sie später auf Favour wartete, erhielt sie plötzlich einen Anruf der Schule, dass Favour bei ihnen bleiben würde und, falls sie ihre Tochter sehen wolle, sie am nächsten Morgen zur Schule kommen solle. Diese Situation überraschte Jubilee und sie wusste nicht, was sie tun sollte. Am nächsten Tag, dem 15. Januar 2019, ging sie zur Schule. Dort wurde ihr gesagt, dass Favour bei ihnen bleiben würde. Jubilee verlangte, ihre Tochter zu sehen. Später bat man sie, nach Hause zu gehen und auf Favour zu warten. Zu Hause wurde sie ein paar Stunden später von zwei Personen in Begleitung der Person, die im Sozialdienst arbeitet, aufgesucht. Man hielt ihr ein Formular vor, das sie unterschreiben sollte, was sie verweigerte. Man sagte ihr, dass man ihr nicht erlauben würde, ihre Tochter wiederzusehen, weil sie nicht unterschrieben hätte und dass man vor Gericht gehen würde, um ihr das Recht über die Tochter entziehen würde. Am Mittwoch, dem 16. Januar, erhielt sie einen Telefonanruf mit der Ankündigung des Gerichtstermins für den 23. Januar 2019. Bitte, ich bitte dringend um solidarische Unterstützung, so dass Jubilees Tochter Favour wieder nach Hause kommt. Der Ehemann von Jubilee und Vater der Zwillinge ist nach Karlruhe umverteilt worden, all seine Versuche, mit der Familie zusammenzuwohnen, sind gescheitert, weil sie nicht zur gleichen Zeit in Deutschland angekommen sind. Bitte, bitte, bitte, lasst uns helfen und diesen dringenden Fall unterstützen. Statement of The VOICE Refugee Forum on the Kidnapping of a member of an African Family and the ongoing, active and persistent destruction of the family of Jubilee Sunday. Jubilee Sunday is a Nigerian asylum applicant. She came to Germany in March 31st 2018 with a pregnancy together with her daughter Favour who is 8yrs and 6months. They both asked for asylum in Hannover. Sister Jubilee has also been separated from her husband, the father of her newly born twins, by the German authorities. He was sent more than 450km away from his sons and has been fighting for family reunion ever since. After kidnapping her daughter who went to school in the morning and never came back and as if that is not enough, Jubilee was subjected to a court hearing on 23rd January 2019 in Peine (Niedersachsen) for being a mother to her first child. The court procedures sole aim was to legalise the kidnapping and further estrange Favour from her family. Jubilee herself was not heard during the hearing and didn‘t have the possibility of speaking and expressing her point of view. The decision was taken over her head. It’s been almost three weeks that Favour disappeared from the family radar and the same reason is going to b used to destroy the family bond that has existed for more than 8 years. The VOICE Refugee Forum was further informed that the reasons for the kidnaping was a complaint by the daughter that the mother treated her badly and didn‘t give her food. The mother Jubilee strongly denies these allegations. As the girl also complained of being neclected in favor of the new born twins and due to the fact the her complaints started with the birth of the twins it is very likely that the eight year old Favour is showing symptoms of jealosy against her newly born brothers. This is a very normal reaction of children who suddenly have to share the love of the parents with new siblings, a situation which certainly cannot be solved by taking the children from the parents. At this point we strongly insist in the right of the mother to raise her child – and the right of the child to live with the mother. We also call for the reunion of all family members of this African family. Especially for an African child the connection to their African roots, background and identity is of high importance. But unfortunately we often experience that German authorities are very fast in taking African children away from the parents under the pretext of the so-called „well-being“ of the child – be it because the parents‘ capability is doubted, or in an attempt of „Germanization“ of children, i.e. of pushing back African influence and culture in the children and subjecting them to so called German cultural values - which is also a tactic to facilitate deportation of the parents one day. Let‘s remind ourselves here of the campaign of Claudia Omoroghomwan against the authorities for the right to live with her children (http://thevoiceforum.org/node/1727 ) that we supported. We also see it as crucially important that Jubilee‘s husband and father of her twins has the right to stay with his family – so that his sons can grow up with the father and that the load and responsibility of raising three children can be shared by both parents..
We are in strong solidarity with the case of Jubilee Sunday and we are cautiously and critically watching. We are urging all responsible authorities and institutions to take our worries very seriously! This report was sent to us by a family friend (Joseph from URRM, Karlsruhe). „Solidarity support urgently needed for a Lady by the name Jubilee Sunday from Hohenhamel, Hannover. Jubilee Sunday is a Nigerian refugee. She came to Germany in March 31st 2018 with a pregnancy together with her daughter Favour who is 8yrs and 6months. They both asked for asylum in Hannover. In April 17th 2018 she delivered twin boys while still in the camp and later in the month of July 2018 she was transferred to an asylum home together with her children in Hohenhamel. They are the only blacks and only Nigerians living there, other refugees there are Arabs . Little Favour was admitted to a school. A school bus comes to pick them up every morning with the Arab children and return them back after school closes. On Monday January 14th 2019 little Favour went to school while her mother took care of the twin babies at home. Later that day as she is waiting for Favour, she received a phone call from the school administration that Favour will stay with them for three days and that if she wants to see her daughter Favour, she should come to the school on Tuesday morning. This situation surprised her because she doesn't know what to do. On Tuesday 15th she went to the school. She was told that her daughter Favour will be staying with them. She demanded for her daughter Favour. Later on Tuesday Jubilee was asked to go back home and expect Favour. As Jubilee went home, a few hours later two persons together with her social worker came to her with a sheet of paper for her to sign, which she refused. She was told that she will never be allowed to see her daughter Favour again since she did not sign and that they will go to the court to have right over the child. On the Wednesday 16th January, she received a call that the court day is 23th January 2019. Please l ask for solidarity support urgently so that Jubilee have her daughter Favour back home. The father of the children was transferred to Karlsruhe Camp, all his efforts to be united with her family have not been approved or granted because they did not arrive the same time in Germany. Please, please and please let‘s help and support this urgent need!